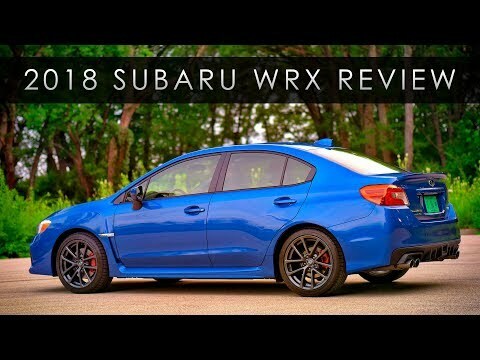 Visceral and exhilarating, the all-wheel-drive 2018 Subaru WRX is a high-performance sports-sedan bargain with a starting price well below $30,000. Updates for 2018 include revised styling, improved handling and increased comfort. Two models are offered, the 268-horsepower WRX and the 305-horsepower WRX STI. Both are packing turbocharged horizontally opposed 4-cylinder engines and a standard 6-speed manual transmission. I drive a 2018 Subaru WRX. It is the base model so it doesn't have all the features. It has a black fabric interior with some leather features on the interior of the car. It's a stick shift car so when I first got it it was little stiff when shifting. Now that I've been driving it for a little while(5,000 miles since I purchased) and it has 18,000 miles on it, it shifts really smoothly now. It's a super fast fun car that grips to the route on the turns and it performs far better than I thought it would. The WRX is the original sparkly blue such unique color. One thing that is not that great is the price for an oil change, but the car is a turbo and drives like a dream so a pricey oil change is fine in my book because it puts out the right amount of power for my day to day driving. The interior of the car was very well thought through when they built it's very roomy and modern. Now for the exterior. The exterior like I said is a beautiful blue shade. It's very sleek and the style of the vehicle will remain timeless. I love this car so much. In our house hold we have 2. The other is a 2015 and it is almost identical with some minor upgrades. We love them both because of their reliability and comfort. It's my pride and joy. It's very fun to drive. All wheel drive, comfortable, great handling, and attractive. All wheel drive makes it safe not to mention that it is a Subaru, top in safety. The handling is excellent, the interior is super spacious, and the mpg is decent for it is type. I was looking for something reliable, safe, and with good performance and it has lived up to the hype. I have had no problems with it and there is a lot of potential to it.